An embossed floral design adds texture to soft, faux leather, giving the Maddie a luxe look and feel. Slip this beauty on and get the buckles adjusted just right. 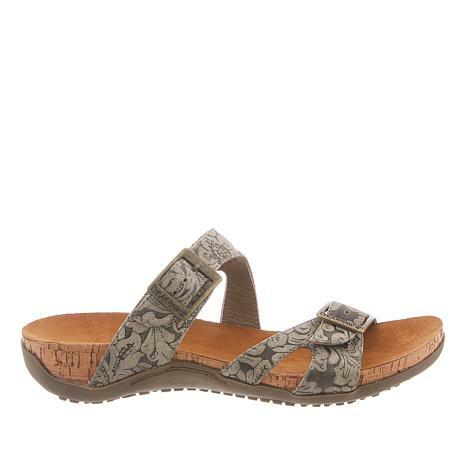 Then settle in to the contoured, padded footbed covered in microsueded fabric. Ahh, very nice. runs small had to size up . I love the look of the shoe. It is very flattering to the foot . it is also very comfortable . The footbed is a perfect fit for my feet and most comfortable. I started wearing them as soon as I opened the box and I love them! 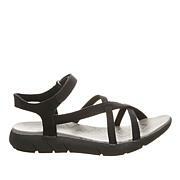 I love the look, love the comfortable soft footbed. Ordered a size 8 as soon as I took it out of the box I noticed it's going to be to small. They run extremely small. Sadly had to send them back. This is a well-made shoe. It's good looking too -- quality shows. This is also my favorite style -- slip in and go. But I need it to feel secure and it doesn't quite fit securely. My foot is not wide or narrow, just regular width. This shoe leans to the wide side on me. I had to tighten both straps. I am worried the leather will stretch and my foot will slide around. If your foot is regular but leans to the wide side this shoe will probably be good for you. I've worn them outside and will keep. I love bearpaw but this was not my favorite. The fit was way off and too stiff for my foot. I have a higher arch and found it was not a good choice for my foot. Super cute shoe though.